AnonD-211568, 01 Dec 2013Does anyone still not understand the difference between people that are happy running an iOS d... moreExactly. This is what Windows RT has been created for a snappy experience with a light hardware. Windows somehow failed convincing me last year with the limited apps. The marketing was just bad for the RT. The hardware between the Surface RT and Pro were too similar that had people confused. MS had limited the Pro's hardware improvements so that the Surface 2 (RT) would really get noticed. I really dig the that beautiful flatness and the productivity services & apps bundle. I don't need a full Windows because I already have a heavy a heavy powerful laptop. The Surface 2 is a perfect productivity alternative than an iPad. I need that keyboard cover. I need that discreet kickstand. Does anyone still not understand the difference between people that are happy running an iOS device and a Macintosh computer? Does anyone want full blown MacOS on their tablet? no virus, no malware, no spyware....CLEAN computing environment. That's the point behind the Surface 2 and Windows RT. And yeah, Microsoft isn't planning on having full blown Windows on their PHONES, where there will again be the fear of viruses, spyware and malware. The Phone OS will eventually become Windows RT..which is a better OS than Phone OS. TheNeighbor, 01 Dec 2013The article continued: "But her comment didn't end there. Instead she continued with w... moreI think she was talking about merging three OSs into one. Key part will be bringing desktop API to WinRT so that new desktop application can work on x86 and ARM devices. API is already there (office for ARM is an example of it). Maybe they are just waiting for faster ARM CPUs and more memory because of heavy multitasking nature of desktop environment. "But her comment didn't end there. Instead she continued with what sounded an awful lot like a defense of RT: "We do think there's a world where there is a more mobile operating system that doesn't have the risks to battery life, or the risks to security[...] So we believe in that vision and that direction and we're continuing down that path." Given that follow up and the state of the mobile OS market, it might actually make more sense for Microsoft to fold Windows RT into its somewhat more successful Windows Phones OS than give it the full axe." I saw the Asus T100 Atom Bay Trail Transformer. The 64GB version costs $50 less than the Surface 2. It comes with a keyboard and is 23mm+ thick total compared to the 12mm+ thick total of the Surface. The T100's keyboard is reviewed as bad with some keys not registering randomly. Reviews for the Type cover as impressively accurate plus the Office suite are things that are important for me personally. People also shouldn't be fooled with what a full Windows can only do running on an Atom Bay Trail processor. Fear1ess, 01 Dec 2013The ability to do something doesn't mean its productively efficient.Don't fool yourself that t... moreIf you have been reading my past few posts, you'll see I won't be getting rid of my gaming laptop for any tablet. The Surface 2 does fit my mobile needs for my writing, spreadsheets, browsing, research, presentations and video entertainment. I have no delusional expectations that it can do Revit, 3DS Max, Photoshop, or any other full Windows programs, or replaces my Alienware laptop. It's a snappy machine with that brilliant screen, discreet kickstand, HDMI port, USB 3.0, micro SD slot, and I'll be getting the snappy Type cover. I know what I'm getting. TheNeighbor, 01 Dec 2013"Strictly for amateur usage"? "Most likely be the iPad"? "Nice toy... moreThe ability to do something doesn't mean its productively efficient.Don't fool yourself that tablets can substitute pc or laptop for real productive work.Like TheNeighbor said the tablets are pure amateur-usage oriented. AnonD-209094, 01 Dec 2013Strictly for amateur usage, a professional would need real Windows to run x86 applications, fo... more"Strictly for amateur usage"? "Most likely be the iPad"? "Nice toy like Android tablets"? Android tablets offer more "across platform" tools with direct file transfers, phone calls, SMS and screen mirror casting than a restricted iPad could. The Surface 2 can do more connectivity to printers or networked files via its full USB 3.0 port, HDMI connection to projectors or bigger screens, has an integrated discreet kickstand and highly proactive keyboard for its full Office Suite than a mere iPad. I can really congrats Microsoft for trying a different approach rather than trying to mimic the ipad.The problem is the surface concept is half baked.Its a hybrid not a true tablet cause of the keyboard and not a true laptop cause of the arm based nature.Probably the most crucial thing is that you can't use the surface and keyboard anywhere else but on table or desk which is a big deal since it directly kills its main purpose the mobility. Strictly for amateur usage, a professional would need real Windows to run x86 applications, for example field engineering work, the programs used often exist only in x86, and if available for other platforms it will most likely be the iPad. Nice toy, just like Android tablets, but not likely to be heavily used, again just like Android tablets. If you really need a professional tablet then your employer will provide you a something like Surface Pro, Vaio Tap 11 or even the Vaio Duo 11. TheNeighbor, 30 Nov 2013Ok, let's put things into perspective here. Windows RT cannot run full fledged programs lik... moreI appreciate your point of view, though I'm afraid I'll have to disagree. Windows RT is basically "Windows for ARM". But it's just -not- Windows. And it should -never- be marketed as Windows. That's what caused misconception among user. Tablet used to use ARM processor, because in the past no x86 processor can give good performance and efficiency as ARM did. But now, intel x86 Baytrail & Haswell can perform as good as ARM in tablet. So there's no more reason for "Windows for ARM" to exist. Did you read Windows RT news lately ? MS exec gives hint to kill Windows RT. It's all over news in the past 5 days. 'We have the Windows Phone OS. We have Windows RT and we have full Windows. We're not going to have three. ' "
Just google it, https://www.google.com/search?q=windows+rt&t­bm=nws , more reason to avoid Windows RT. TheNeighbor, 30 Nov 2013Now I'm sure it was the right decision to order the Surface 2. Thanks, GSM Arena for the batte... moreYou are right, Microsoft shall emphasize on the Win RT can perform additional screen when connect to monitor/Tv. This can be a strong point what make Win RT different compare to iOS/Android (only mirror the tablet screen), beside serve as tablet function like the others. TheNeighbor, 30 Nov 2013Ok, let's put things into perspective here. Windows RT cannot run full fledged programs lik... moreYa, you are right, many just confused on the productivity and expect full windows on Win RT, however they din expect Mac OS in iPad. I like best is Win RT can have additional screen to do different task when connected to a monitor/TV. however iOS/Android other only serve as mirror screen purpose. Synonymous, 30 Nov 2013Is this still using Windows RT ? Oh my, Windows RT clearly has no future. With recent boom... moreactually i quite like Windows RT. it really useful when you know how to fully utilise it. Windows RT work most like normal PC, just that unable to run x86 software. When you connect to a monitor, it serve as additional screen. not like iOS/Andoird which oly serve as mirror to tablet. For enterprise internal application, of course you cant find it in Windows store, as they will custom install from company. Same goes to Appstore, you can't find enterprise application, they install from company through iTune. Maybe application in Windows Store are much lesser compare to other platform. But since you have the actual need like for example Microsoft Office, you don require 3rd party develop alike application which may fill in the store thousands apps. Another example media player, Win RT support a lot of file format, however iOS support a little that why got thousands of 3rd party application for media players. AnonD-48141, 30 Nov 2013vaio tap 11 end of storyYou don't compare the Tap 11 with a Windows RT based slate like the Surface 2. 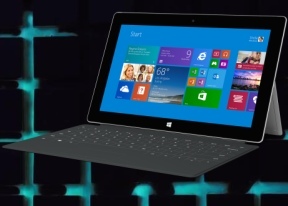 The Tap 11 easily under performs against the Surface Pro 2 which runs full Windows 8.1. This what I meant about the confusion on what is Windows RT and what is Windows. Anonymous, 30 Nov 2013Name those professional operation that you can do with Surface RT but you can't do with iPad.Granted that the iPad Air has all the respectable features you enumerated, there are simple things it just can't do and has - direct files transfer to any device via bluetooth; direct-wifi for faster large files; multi-tasking & multi-windows interface; expandable memory slot of up to 64GB with a small $50 price; a nifty integrated discreet kickstand and keyboard, and a HDMI connection to an external monitor for a desktop or home entertainment setup without an extra device. The first gen iPad was pretty disappointing and wasn't all that productive compared to a netbook 5 years ago. After all those tweaks by developers and borrowing stuff from the Android development, it is what it is today -a better media consumption and entertainment device, with productivity. I think Microsoft deserves some credit with the Surface lineup emphasizing on productivity and elegance. Most people are just confused what RT is because they aren't bothered how it works, just like they don't question why iOS can't run full Mac programs. Despite the Windows RT store lacks some of the more popular apps, I got the Surface 2 because it offers more features than mere lighter weight, cellular service, mere 1.4mm thinner difference, slightly better screen resolution, and 1 to 2 more extra hours of operation. Ok, let's put things into perspective here. Windows RT cannot run full fledged programs like Adobe Photoshop. It's a simpler version but looks, behaves and performs like a full Windows OS. I think this confuses a lot of people. Some reviewers are recommending an Asus T100 Transformer that runs full Windows, but look at its hardware - the latest Atom Bay Trail processor, 2GB Ram, fairly good screen lower than FHD screen, detachable keyboard with battery and it has a total thickness almost an inch or 23.6mm with the keyboard closed. For the common person, that's like "better" since it can run Photoshop. It can run CAD too. It cost $350-$400. Fine. But what he/she doesn't know is those full programs will run sluggishly for that slate. The start interface will run smoothly, but you can't however heavy graphics games like Left 4 Dead. So then why struggle with a set-up like this when the netbooks first were introduced some 5 years ago (except without capacitive touch screens) with the same sluggish performance with full programs that actual can run in them? This is where a Windows RT OS can run casual apps smoothly, just like what Apple did with iPhone/iPad snappy experience. Their Mac full computers run on an entirely full computer OS. Imagine if they tried using that same full PC OS on their iPads... Would you think they will run smoothly and their battery laying that long? But because Apple did an affordable apps store successfully first with the control of the market till now, with Android close behind, of course Windows RT has a lot to catch up. I'm just waiting for my Surface 2 to arrive. I see positive possibles in a Windows RT productive experience. James, 30 Nov 2013I dont get it. Android and Apple are hopeless as a real business tool as you can only look and... moreName those professional operation that you can do with Surface RT but you can't do with iPad.